Book News: Story By 'Catch-22' Author Published For The First Time : The Two-Way Also: The 2013 Man Booker Prize longlist is out; Junot Diaz annotates his own work; book critic Dwight Garner on the dangers of reading. 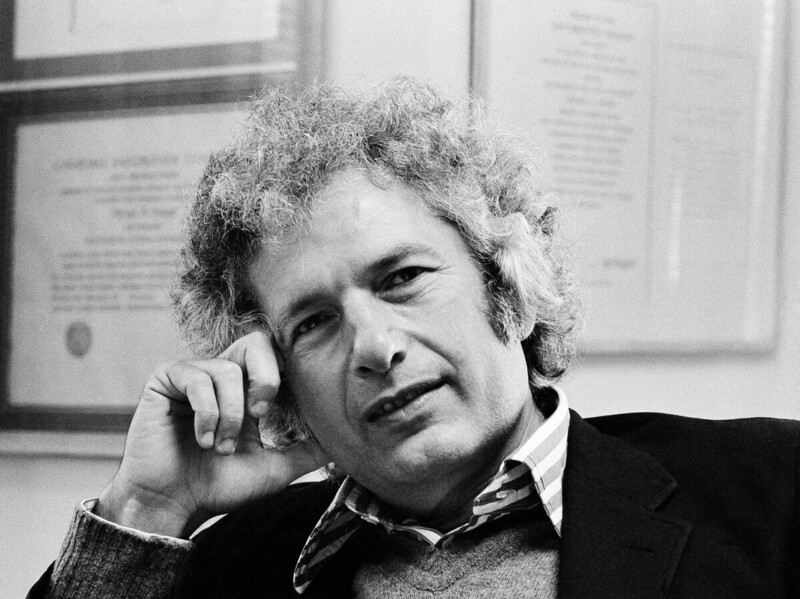 Author Joseph Heller in his publisher's office in New York City on Oct. 9, 1974. A previously unpublished short story by Catch-22 author Joseph Heller comes out today in The Strand Magazine [subscription only]. The magazine's editor, Andrew Gulli, said he found the story in the library archives at Brandeis University while doing research. "Almost Like Christmas" is a grim tale about a racially charged street fight — filled with what Heller calls "the primordial brutality of an alley fracas" — that leads to a racist mob. A black boy stabs a white man in self-defense during the fight, and the story is heavy with the anticipation of a lynching. Heller writes: "It's almost like Christmas the way everybody's walking around in a fever of excitement. Don't let their anger fool you. It's a chance to feel important, and they're going to use it...Everybody wants to be respectable, and joining a mob is the easiest way." Gulli wrote in an email to NPR, "I think in many respects the story has a lot of the dark and cynical view that Heller had of mankind but since it was an early piece it didn't have his trademark humor." Gulli also had an interesting conversation with Here & Now co-host Robin Young. The 2013 Man Booker Prize longlist was announced Tuesday morning, and it features Colm Tóibín's Testament of Mary, NoViolet Bulawayo's We Need New Names, Colum McCann's TransAtlantic along with 10 other novels, including Jhumpa Lahiri's The Lowland, which has yet to come out. The chairman of the judges, Robert Macfarlane, tells The Guardian, "This is surely the most diverse longlist in Man Booker history: wonderfully various in terms of geography, form, length and subject. These 13 outstanding novels range from the traditional to the experimental, from the first century AD to the present day, from 100 pages to 1,000 and from Shanghai to Hendon." The shortlist will be announced Sept. 10 and the winner on Oct. 15. Junot Diaz annotated a footnote from The Brief Wondrous Life of Oscar Wao on the website PoetryGenius, a spinoff of RapGenius, "a hip-hop Wikipedia" where users explicate rap lyrics. (Diaz's publisher confirmed to NPR that it really is him.) The footnote describes the "wasteland" of Outer Azua in the Dominican Republic. But Diaz notes: "Ázua is much more geographically diverse than I'm letting on here. (But us writers we'll break a whole world up for the sake of a metaphor.)" Elsewhere, he writes about his use of footnotes: "This is one of my Melville footnotes, where I simply go buckwild. ('Get me a condor's quill! Get me Vesuvius' crater for an inkwell!') The first editor I had on this novel wanted me to cut the footnotes. I'm so glad the second editor thought they were as important as I did to the book's point about what narratives we authorize what narratives we don't." New York Times book critic Dwight Garner considers the dangers of reading: "Among the professional hazards of being a book critic is the nap. Naps sneak up on you. They are beautiful but, like recreational drugs and termites, they can undermine the foundations of your existence." The Los Angeles Review of Books posts a satisfyingly crotchety interview with London Fields author Martin Amis: "When I hear about some sensational new writer I sort of think, Shut up ... you've got to be around for a long time before you can really say you're a writer." The rapper 2 Chainz says his next album is coming with a cookbook. Mr. Chainz (the rapper formerly known as "Tity Boi") adds, "That'll probably get me on The View or something like that."